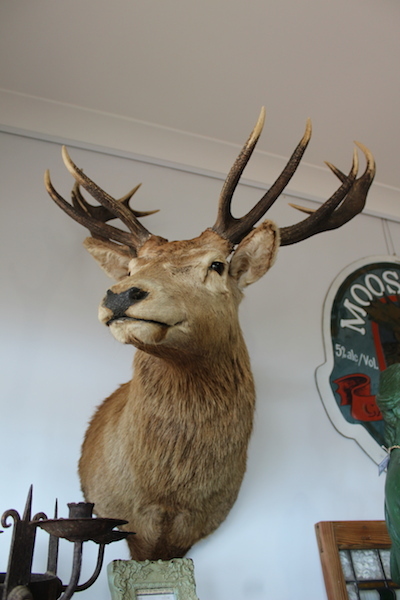 Home / Antiques / So.. What is Antler? Deer antler is not horn – it is bone. In fact it is the only animal that grows bone outside its body! Antler growth on the male deer occurs in the warm spring and summer months and the duration of growth is approximately 3 1/2 months. In the early stages of growth the antler is soft and full of blood. The outer layer has a soft coating that looks and feels like velvet material. The antler progressively calcifies and this outer layer dries and falls away, leaving a calcified antler. As the antler fully calcifies the males testosterone level rises and peaks around the full moon, each Easter. The animal uses his antlers to mark out territory and to fight rival males during the mating season. This lasts approximately 6 weeks, then the males rest up over winter and as nature provides new growth in the spring, the old antler falls off and another begins to grow.